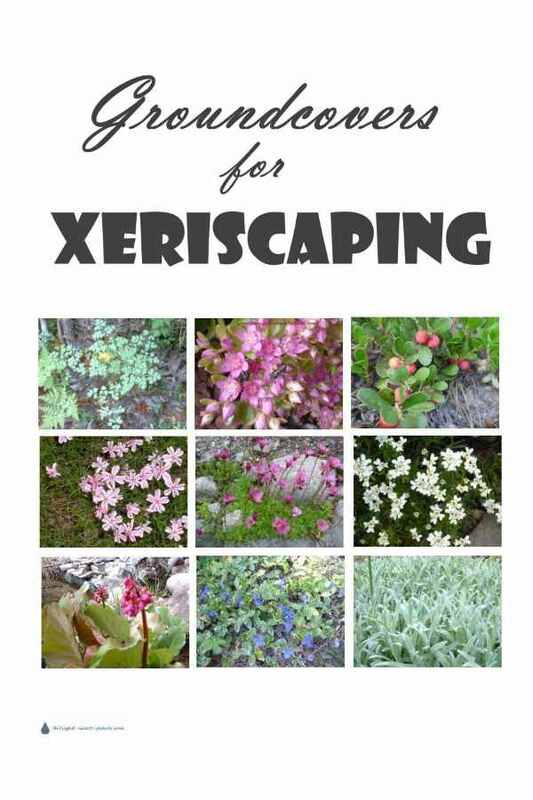 Groundcovers for your xeriscaping are an important part of the overall design. Lots of other plants besides my favorite Sedum, Sempervivum and thyme make great groundcovers in droughty conditions. Here are some other plants that are particularly well suited for the tough conditions they’ll find in your xeric garden. Many of these groundcovers do double duty in fire smart gardens too, such as Arctostaphylos uva-ursi and Cerastium tomentosum. If you garden in a potential fire risk zone, this is something to think about when planning your xeric garden. Some of these drought smart ground covers have the advantage of weed suppressing foliage, many with bright flowers in season. Others have texture and colour in the foliage. Moss and lichen can be used as a drought tolerant ground cover too. 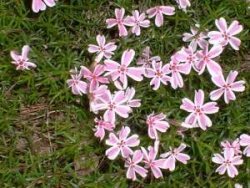 All of the plants on this list of ground covers are hardy to Zone 5b. 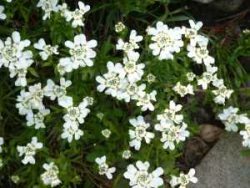 Use them in multiples of the same plant throughout your garden to surround trees, cover banks or cascade down cliffs, or in island beds to reduce your water sucking lawn. Don't use the 'polka dot' method of planting, with one of every different kind of plant dotted around the landscape - always plant in groups or wide swaths to give more emphasis. Always prepare the ground well with the addition of compost before planting. Mulch well to conserve moisture in the soil - even xeriscape plants need water. 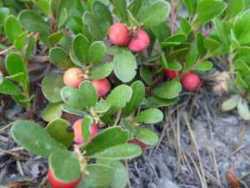 Arctostaphylos uva-ursi - bearberry or kinnickinnick is one of the most beautiful, and hardy groundcovers. As a native to many areas of British Columbia you'll see this plant grow especially well in acid and sandy conditions. Glossy green foliage on long prostrate stems twine along the ground. In the spring it has little pink urn shaped blooms which ripen to red berries in the fall. Grouse love these berries! 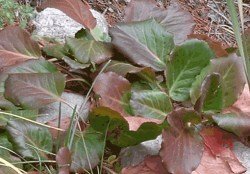 Bergenia cordifolia - also known as pig squeak from the noise the leaves make when rubbed together. The succulent looking green leaves turn burgundy red in fall. Pretty hanging bells in a cluster last for over a month starting in May, attracting bees to some of the first blooms. Cerastium tomentosum, or white rock is a great small scale drought tolerant and heat tolerant groundcover. It's covered in small white rose shaped blooms in spring, then the clean grey blue foliage always stays in good shape, even into the fall. Watch for this plant, as it can try and take over, but luckily, it's easy to weed out sections if it gets too assertive. 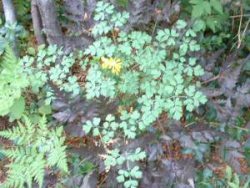 Corydalis lutea - blue green lacy foliage which looks like maidenhair ferns, except for the bright gold flowers in spring. This plant has the survival technique of going dormant and disappearing when the weather gets really hot in late July in another drought smart strategy, to emerge in spring after the snow melts. This is one of those plants that you remember from childhood as it's a classic. Iberis or candytuft has great texture as a non-steppable groundcover, and will be covered for weeks in white, pink or purple flowers. It's perfect as a weed smothering cascade down a rock wall or bank. The evergreen foliage is attractive even in winter, and when the billowing form is almost hidden in blooms it's exquisite. Added attraction – solitary bees and wasps love it. Phlox subulata 'Candystripe' is a drought hardy little character. It's sharpish needle like leaves form a sprawling mound, which in spring is covered with these great flowers. What a surprise! There are many different kinds, most with mauve, pink or white blooms but not many are striped like this one. 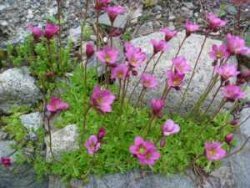 Many rock garden plants, such as Saxifraga arendsii ‘Purple Robe’ with its pink to red rose-like blooms in spring are exceptional as groundcovers. Fresh green finely cut leaves cascade down rock walls and fill in between boulders. Contrary to its appearance as a dainty delicate thing, it's hardy and tough in challenging conditions. See more about Saxifraga here. 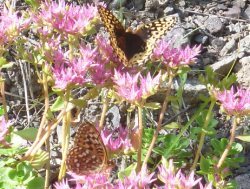 Sedum - one of my favorite of all creeping and low growing ground covering plants; erosion control in challenging conditions, and beauty, as well as nectar and pollen to attract beautiful butterflies; what could be better than that? 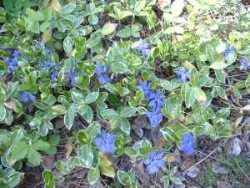 Vinca minor or periwinkle are great for a dry shaded area, such as under tall coniferous trees. 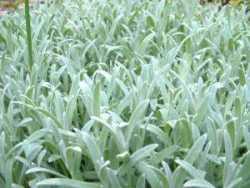 Covered in blue, white or pink flowers on shiny green or variegated leaves make this vining groundcover valuable for areas that won’t be walked on, but where you want to totally squelch weeds. I’ve seen this listed as a bit invasive, so please don’t let it escape captivity in your area! in some places have been labeled as noxious weeds. See more about my Garden Mistakes here.